The towing solution for lighter ball weightsThe two bar (2 x 19mm) Mini system uses chains to hold the spring bars in position and is designed to be used with any Hayman Reese towbar. This WDS is easily setup and removed and is ideal for trailers with a ball weight up to 80kg. The ideal solution for intermediate tow ball weightsThe intermediate system utilises a four bar (4 x 19mm) system. This system has a working range between 80kg and 135kg ball weight and is ideal for smaller trailers. The snap up brackets make raising and lowering the chain effortless. Triangular plates mean you can adjust and equalize each pair of bars together. which are connected to the trailer’s A-frame. Note: A minimum 4 working links is required. Hayman Reese’s 600lb or 275kg rated hitch is by far the most popular towing aid in Australia. Perfect for trailers that have a ball weight between 135kg and 275kg, this system suits most popular caravans available today. The 800lb Heavy Duty system relies on heavier gauge spring bars to handle heavier trailers. As the name implies the Heavy Duty kit is designed to work with trailers that have a ball weight between 275kg and 365kg (800lb). Hayman Reese Distributors around the country. The Hayman Reese Medium and Heavy Duty Classic Series feature the traditional tried and tested welded Weight Distribution Head with trunnion style spring bars. The standard Hayman Reese Medium and Heavy Duty systems feature a tried and tested cast Weight Distribution Head with round style spring bars. Round spring bars allow for more clearance with 6″ trailer chassis. Hex Cam washer enables 6 incremental head angle adjustments of the Drop Shank which allows 6 height adjustment positions. 19mm bolt diameter for improved strength and durability. High Performance spring bars with integrated cams are designed to work in conjunction with the dynamic Dual Cam HP™ sway controller. For extra heavy duty applications the 1200lb system has a working range of between 365kg and 545kg ball weight. For towing loads in excess of 3,500kg, use of a 70mm towball is required.. Cast Weight Distribution Head. Includes integrated friction sway control tab for upgrade to basic sway control. Fine tooth adjustment washer provides greater flexibility enabling up to 9 incremental head angle adjustments. 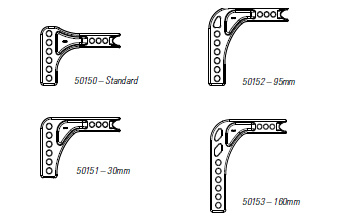 In addition to this the Drop Shank allows 6 height adjustment positions. The Medium (600lb), Heavy (800lb) and Super Heavy Duty (1200lb) WDS kits have been designed to be used with a Hayman Reese Class 4 Heavy Duty Towbar to safely tow trailers. The height of the towball can be raised and lowered to address the trailer’s coupling at the correct level by using the adjustable shanks. The heavy duty cam washers and bolts (fine tooth adjustment washers for Super Heavy Duty) also allow the adjustment of the towball position. This is used to set the head angle, which in turn sets the angle of the spring bars. These units can be adjusted to suit passenger and light commercial vehicles, and can be easily setup on your new vehicle and trailer as you change them. Shown below are some typical setups. A range of Drop Shanks is available to setup 4WDs and applications where the lowest/highest setting is not low/high enough. Always seek advice from your nearest Hayman Reese Distributor before fitting different sized Drop Shanks to check compatibility to your vehicle.